See all the action from the Point FC's summer football school (see more below). ''All pictures by Sandie Maciver at SandiePhotos photography. One of Point and Sandwick Trust’s biggest local grants of the summer went to Point FC – a total of £3,500 which covered two sets of strips for the Under-13s as well as new goals and footballs, plus souvenirs for the children who took part in the summer football school. It was open to boys and girls from primary two to S2, with priority given to the juniors who play on a Thursday night at the Point astroturf. A total of 65 youngsters took part this year – an increase on last year, when they had between 40 and 50 – and prizes were given for the best players, although everyone got a T-shirt and a water bottle at the end as a memento, plus a certificate for taking part. The money from Point and Sandwick Trust funded these T-shirts and water bottles, as well as two sets of strips for the Under-13s and some big pieces of new equipment. 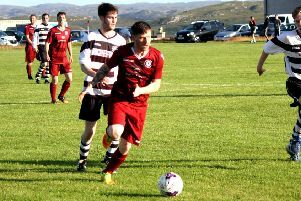 The equipment included one set of nine-a-side goals for the Under-13 games and two sets of four-a-side goals for the younger players, as the ones they were using up till now were on loan from Stornoway Athletic FC. They also invested in additional footballs among other items, so that all the children would be able to play a ball that was the correct size for them. 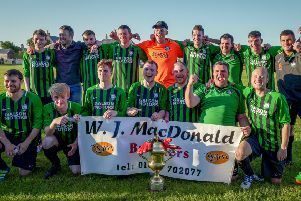 Donald ‘Rab’ Maciver said: “We’re absolutely delighted with the money from Point and Sandwick. Having good facilities and the correct equipment is really important. He said the summer football school had been a great success, too, although it was held over two days instead of three this year, due to the death of Donald ‘Tuff’ Macdonald. It took place from 1pm till 5pm both days and cost £20 per child for the whole event. It was the fourth year of the football school and he said the whole aim of it was for the youngsters to have fun and hopefully improve their football skills – “as long as they have enjoyed it”, he said. Rab’s brother, Matthew ‘Nash’ Maciver was one of the other coaches and he said the majority of participants had come from Point, although there were some who were up on holiday from the likes of Dundee, Ayrshire and Aberdeen, whose people hailed from Point. Children from other parts of the island took part too, although the majority were Rudhachs. He pointed out that the football school is held on the same week as the HebCelt festival every year, which helps parents when they are planning holiday activities. Matthew gave a special mention to the other coaches – including Point manager Angus Stoodie, Ali Gillies, Willie Macaulay and Chloe Nicolson – who had made it all possible. “It’s all these guys giving up their time that facilitates these guys playing. Without them it wouldn’t work. It’s been great. The help from Point and Sandwick Trust meant that all the money raised from the football school – more than £1,000 after expenses – could go directly to the youth teams and allow them to buy more new equipment, such as bibs and cones, and also help towards the costs of trips away. All the equipment bought will be using throughout the year at the coaching sessions at Sgoil an Rubha. These sessions are attended by 30 to 40 children each week, ranging in age from P2 to S1. Rab said: “Thankfully with the money we got from Point and Sandwick, we didn’t need to use the money from the event to buy the T-shirts and water bottles. The Trust got a round of applause from the youngsters at the prize giving ceremony at the end of Friday afternoon, when Point and Sandwick Trust general manager Donald John MacSween helped give out the prizes to the top footballers of the week. The junior winner was Alexander Macdonald. The middle age group was won by Samuel Maclennan and the overall winner was Daniel Macleod. Donald John said afterwards: “We’re more than happy to help Point FC with the costs of this summer school, and with the costs of buying their equipment and strips. “It’s great to see all the kids have such a good time. There’s been a fantastic turnout and we look forward to seeing some of these young people join the Point and Sandwick Board in the years to come and become actively involved with the turbines need replaced in about 25 years time…! “Very well done to all the coaches who made the summer school possible. It couldn’t happen without them and the kids obviously enjoyed learning from them. “They give up their time every year to organise the event and this kind of volunteering spirit is what makes Point and Sandwick such a great community and one that is particularly keen to do the best by its kids. “We support the youngsters and their families at every opportunity, from the smaller donations to the Brownies and to Sgoil an Rubha through to the bigger donations for sporting organisations.